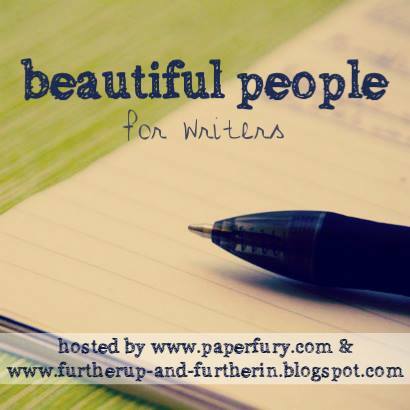 Time for our glorious March edition of the Beautiful People linkup for writers! And since we’re coming up to the first Camp NaNoWriMo of the year, I hope all our brains are busily gathering strength for a writing session. Yes? YES??? I lowkey plan to write something in April, but I also lowkey plan to edit in March. Unless zombies eat me first. (I CAN ALWAYS HOPE SINCE EDITING = TORTURE.) But considering I have neither decided on a project or even opened my Scrivener files…ha ha. Maybe I am a lifeless pancake this March. WHO CAN KNOW. But onwards to the linkup, shall we?! This month we have a delightful assortment of random questions for you. And as a delicious sneak peek — just know that Sky and I have two really exciting and fun themed BP’s coming up so stay tuned! And, as always, if you want to submit questions, hit us up. Don’t forget to pop over and say hi to some other writers! And NOTE: make sure when you’re linking up your post, to only link THE BEAUTIFUL PEOPLE SINGLE POST. Not your whole blog. And don’t link up until you’ve actually joined in the link up. Because otherwise it makes no sense, matey. Is there anything they regret doing? If they were sick or wounded, who would take care of them and how? Is there an object they can’t bear to part with and why? What are 5 ways to win their heart (or friendship)? Describe a typical outfit for them from top to bottom. What’s their favorite type of weather? What’s the worst fight they’ve ever been in? What names or nicknames have they been called throughout their life? What makes their heart feel alive? so what have you been working on lately?! feel free to give me an update so i might chat with you and send forth encouraging chocolate cake crumbs. does anyone here actually like editing?? and if you’re doing April NaNo, what is your project?? Editing is death. Everyone hates it. EVERYONE. THIS IS THE TRUTH. Editing is just plain scary. 😭😂 And omg yay that you’ve started already!! And any pace is a good pace, I say, because at least the story is coming into existence. :’) I hope it’s fun to write!! Okay, unasked opinion from a writer over in Germany: I love editing. :O I just like spending time with my characters, even if have a hard time befriending my plot holes and my pacing issues. I love editing! But I’m wierd. As always, I’m super happy for another Beautiful People! I really need to learn more about my characters, and this is such a great way to go about doing it. XD So thanks for hosting! Splintered Crown is an EPIC title by the way. 😍 I totally get you with the POV jumping thing!! That was me in NaNo because I went from writing an epic fantasy where I wrote from a ton of different people…to a contemporary. And I kept getting limited by my one narrator.😂 But it was good. haha. Ooh!!!! Another Beautiful People!!! I’m so excited to do this, yet whichever character shall I choose??? As for what I am writing, I am STILL WORKING ON EVERLOST, UGH!!! Turns out I had more than five chapters to write. Basically, I’ve got to write 3,000 more chapters, lop off three fingers from left hand, murder a small cow, and throw all of my notes and sanity to the wind. I’m going to use this BP to get to know characters better, though, so maybe that will help??? DUDE, WHAT A NICE TO-DO LIST YOU HAVE THERE.😂 Nothing like lopping off a few fingers. I generally end my books by throwing something off a very tall cliff. Because when they said “write cliffhangers” I THOUGHT WHY NOT LITERALLY!! Mwahah. Oh yes, I know right? I’m just going to staunch the bleeding with my tears. Oh my word, that is a truly epic way to end a book, hahaha!!! I LOVE writing cliffhangers. They’re the best! To be honest, I’ve never edited in my entire life but there are plenty of projects I need to edit. For camp, I’m going to write a story about a white daughter of a plantation owner who finds out her father was actually a slave so then she joins the Underground Railroad. I love getting to explore my characters with the monthly questions! It’s so much fun!! Yay for writing in April!! I’m thinking I might not start at the beginning of April though, if I get my nonsense together and start editing, it’s unlikely I’ll finish in time. 😂 But we can live in hope. BUt YES. Why can’t editing just do itself?!? Like if we leave it alone long enough maybe it will??? Eep, well I’ll look forward to reading it if you do manage to join in!🎉 And yAS that you’re writing in April! And hey, it doesn’t matter how long it takes to get through a project, just so long as it’s growing, right?! I’m currently mentally-plotting the 5th book in an epic fantasy series and regretting everything.😂 No one writes long series anymore!! This is SO DOOMED.😂 I haven’t decided on my April project yet though. Pirates maybe??? Dragons?? BOTH?? Hey, just because long series don’t exist anymore doesn’t mean you can’t write it! Who knows, you may start a trend. 😉 OOH YES COMBINE PIRATES AND DRAGONS. MAYBE SEA DRAGONS WITH PIRATES THAT RIDE ON THEM? OR SHIPS THAT ARE DRAGONS BUT MORTALS HAVE HORRIBLE EYESIGHT SO THEY THINK THE DRAGONS ARE SHIPS??? GAHHH I missed it last month and I’m not sure if I can do it this month. I’ll try, I promise! Because I just started a new WIP (26K in, yay!) and the timing is perfect but it’s also not?? Because I’m starting a new job tomorrow so. It’ll all depend on how dead I am when I get home. XD But I will try and do it. Because I want you to meet some more of my brain children and I think you’ll really like this WIP. Okay I’m new to these Camp Nano things. What exactly is it? What is the excitement around April? I am uneducated!! But I will start working on these questions! And probably even post them today even though I don’t normally post on Sundays because shhh why not? Oh that’s awesome! Okay I totally have to do it! I’ve got to be honest, I like editing. What I don’t like is the amount of time editing takes! I don’t think I’ve ever felt like I’m *done* editing. There’s always SOMETHING that can be fixed. I need someone to tell me to stop or I’ll go on forever and never stop. IM AN EDITING FIEND, fEAR ME!!!! By the way, have you ever read The Thief Who Pulled on Trouble’s Braids? I stumbled across it on Goodreads a few weeks ago, and it looks like the most Cait book of ever. Kind of like a fem Locke Lamora? Haven’t done any NaNo’s yet. I write too slow for it haha. I RELATE SO BAD. 😂 After a couple of read-throughs I’m just not even seeing any of the typos or mistakes so gahhhhh, editing is a killer! This is the coolest thing! This was my first month doing “Beautiful People” and I loved it. I have a question, are we allowed to go back and do “Beautiful People” challenges from other months? I had great fun doing this one, but I never did any of the others, and I think it’d be fun to. Ok I think it’s fine if I do, seeing as you have them in the archive–follow up question on that, in the Beautiful People Meme the archive only goes up to July 2016– did you discontinue it for awhile? Oh yes! You can do the questions of any month at any time, just say they’re from Beautiful People and leave a link to either Sky or my blog and you’re perfectly good to go. And as for the archives…I just haven’t updated them yet.😂 Life is busy. I do. Drafting is, for me, a far greater challenge. Give me a draft to edit ANY DAY OF THE WEEK! I’m not sure yet if I will do Camp or not. I mean, I should. But PAD. Nope, I love editing too! I find writing the first draft SO DIFFICULT, but once I’ve got something written I could happily tinker around with it for ages. Just wondering, would I answer the questions for all of my characters? Or just one? Generally we just pick one character to answer the questions for but it’s ENTIRELY up to you and what you’d like to do! All open for interpretation and creativity! I actually quite enjoy editing. Though I try to alternate drafting/writing with editing, as editing can get a little tedious after too long, sometimes it just feels slightly less “creative.” But then after a concentrated effort of drafting, editing can also feel like a bit of a relief because the hard part of coming up with something is past and now it’s all about refining and tweaking and really making sure each word and phrase are crafted correctly. So, I can’t choose. I like both. I’m weird. I’ll admit it. Good luck finishing up your draft! !